Within the past 10 years Religious Tourism has seen both economic and education-sector growth on a global scale. 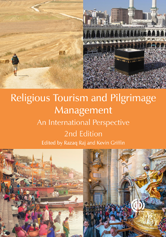 This book addresses the central role of religious tourism and interrelationships with other aspects of pilgrimage management. It provides practical applications, models and illustrations and looks at secular and sacred spaces on a global stage.